Discussion in 'iMac' started by bp1000, Oct 2, 2013. My BTO 2013 Haswell iMac turned up this morning. Love it, here are some performance stats and observations. I only have the tryout version so 32bit only. Just over half brightness - which was boosted from auto sensing which put it at just under half brightness. Pictures taken with 5s so low noise - I think the noise of phone sensors probably exaggerated the issue as noise is colour tinted. Fan made no noticeable change in speed or volume as it was running the benchmarking tests. It is hardly noticeably, it isnt inaudible like my MBA but its still very quiet. Hope everyone else is happy with their 27" iMacs. I know people are worried about their screens with bleed and casting, mine is showing no concerning signs. There is no point trying to benchmark opening programs like iPhoto - its under a second from fully closed. Glad u r happy with your imac they are great machines, hope you continue to enjoy it for years to come. Disc speed is 'insane'; just a comment that Cinebench is showing this as a dual-core chip, when it's actually quad-core. I'm not familiar with Cinebench, so not sure how/if its effecting your results. Congrats and thanks for a quick overview. I'm looking forward to receive my one in 10 days hopefully so I'll be able to inform as well . Great job, thank you! 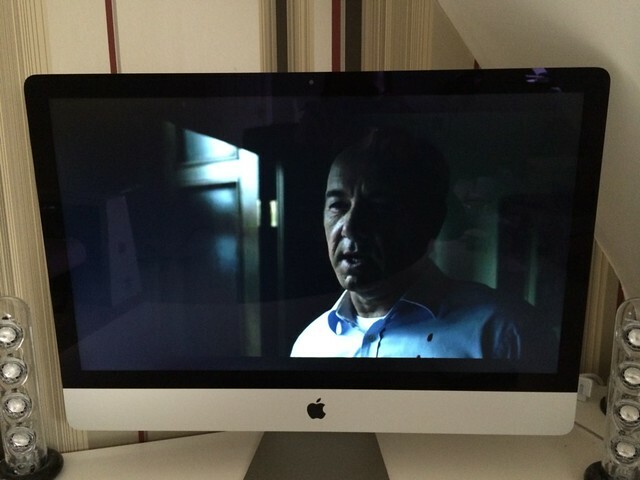 Two observations though: that's some serious screen glare/reflection and you bear an uncanny resemblance to Kevin Spacey. how the hell are you getting these speeds with just a single SSD in there? I think this could be something to do with upgrading the SSD connector from SATA to PCIexpress? Excellent and very informing post, thanks for sharing!! I thought the i5 didn't have HyperThreading, yet it says it has 4 threads? It's still quad core, hence four threads. The i7 has two threads per core, thus eight. I believe. Someone correct me. You are right, however, I pointed out above CB is calling it out as a dual core, hence the confusion of 4 threads. I think its just a CB display error. 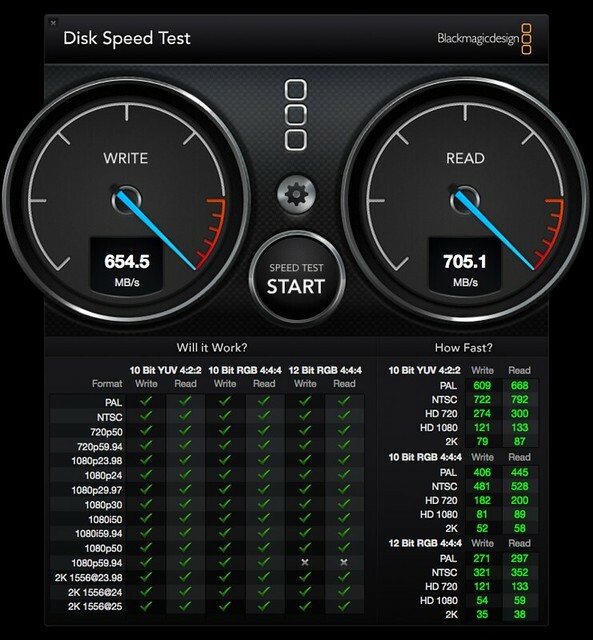 That SSD speed is insane. So glad I opted for the 512GB SSD upgrade. This will be a hell of an update from my current 2009 27" and its pokey 1TB spinny disk. I noticed that cinebench issue too, perhaps its not correctly reporting the Haswell chips, i tried to get the latest download of it. Power consumption monitoring is off now but at idle desktop / reading web pages it ranges from 25 watts min screen brightness to 70w max brightness. That is damm impressive. And yes my screen bleed test did have major reflections, there is a window to the left of the iMac shining on the glossy desk but very pleased with screen. With most of my apps installed i only used 19GB of space! - i think it would be a different story if i stored my photos on the internal drive of which i have over 200GB. I also have 400GB of music but its all itunes matched now. My photos will live on my external drive when it turns up. I anticipate my Aperture cache and meta data to be around 30GB on the SSD. Memory : i opted for factory 16GB. I know many of you will install it yourself but its good to know Apple installed 2x 8GB so i'm free to install a further 16GB kit if i wish. So no wasted sticks. Congrats on your purchase,can you post some gaming benchs ? Do you use Windows7/Bootcamp? If so, a 3dmark11 test would be great to see the performance difference compared to 680MX. Anyways, congratulations with you new iMac, it's a great machine! I can sign that too, I'm switching from a MBP mid-2010 with 8GB ram and any idea how this would perform on Mac-native games would be much appreciated. Good info, thanks! Also, I have those IKEA lamps on my bedside tables. About every two months the threading on the pulls comes loose and I yank 'em right out. I am happy to do gaming benches, however do you actually mean in game benches or is there a program i can use? I dont have bootcamp set up yet, i dont have a copy of windows (it has been a while). But i am planning on setting bootcamp / windows up for some gaming in the near future. I'm sure you will have yours by the time i get around to it. I was initially surprised by your geekbench score, but then realized you got the i5. I don't understand why anybody wouldn't upgrade to the i7. Last years i5 27" was a 10,643, about 500 less than yours, so that makes sense now. Last years i7 was a 13,772. Actually a bit faster. I just got 14191 in 64 bit mode with Geekbench 2, this with Safari, iTerm2, Colloquy, Mail, Citrix and Tweetbot all open. I don't understand why anybody wouldn't upgrade to the i7. Because many of us will never utilize the benefits the i7 will give us outside of wonderful benchmark scores. Very true, with tight budget many people would rather go for better GPU or better storage - Fusion, SSD rather than seeing a different between i5 and i7 but all depends on the workload. Hallo. Which ram's brand has Apple choice for the new iMac 27"?